Credits list NOT COMPLETE yet! Thanks for sharing and teaching! Updated more compact and lighter CQB variant. Full auto fire, spray and pray. Underslung shotgun, devestating at close range. Personal defense weapon - a trusty backup for close encounters. Fires pump action loaded buckshot shells, duckbill style muzzle. Fires "Dragon's Breath" incendiary ammunition. No trigger break 4-round bursts, close grouping. Panic mode! Unleash 1200 rounds per minute and blanket a whole area with a hail of bullets. Standard issue USCM assault weapon - a bulky but reliable workhorse. No trigger break 4-round bursts at 900rpm, close grouping. Grenade Launcher, not very accurate but devastating. Standard issue CQB support and anti-biohazard weapon - stay toasty. Flamethrower. Throws flames. A limited range stream of fire. Panic mode! Open the valve and roast the whole party at once. Sprites aren't final but sounds and firing pretty much are. The flame thrower code is taken from Realm667 and slightly adjusted by myself. What do you think? Last edited by willkuer on Thu Mar 29, 2018 7:57 am, edited 43 times in total. Looks pretty nice! The pulse rifle sounds a little off though, like it's too high pitched. Last edited by willkuer on Wed Jan 18, 2017 5:34 am, edited 2 times in total. Yeah, I figured I could manage that with using A_PlaySound instead of defining an AttackSound. Split the firing sound in attack/loop and the falloff/reverb sound and play that after the ReFire check. I'll try that next session, maybe tonight or tomorrow if I find time. On another note: What do you guys say - underslung launcher: Grenades or rockets (straight firing line)? The flamer is hacked/drawn from a Duke Nukem 3D custom M16-sprite. It's subject to change still - the one in the movie looks a bit different. But I want to have a solid mod/code base plus sound effects ready first. As for the grenades: See my question to the community in my above post/reply 'Cause to be movie accurate they'd have to fly more like rockets than bouncy 'nades... I think. What do you guys think? I made a version with two Pulse Rifles in slot 2. One with looping firing sound and a tail/falloff when releasing the fire button, plus the original one. The first also features a rocket launcher instead of a grenade launcher. The looping sound is taken from the 1999 AvP game, since mine didn't loop well (too much sharp attack). Also it fires in three-round-bursts for timing reasons. If there is a better way to do it, please let me know! Ok, so here we go with a new version. I decided that my personal twist on the USCM theme will be fun-to-use secondary fire modes for all of the guns. But beware! Most of them eat through your ammo really fast. ...also, some new sprites. Still work in progress though. Feedback, ideas and/or help are welcome! Last edited by willkuer on Wed Jan 25, 2017 4:16 am, edited 1 time in total. -The M41A's altfire shoots a rocket that travels in a straight line and seems to have a bit of a spread - I don't think this is intentional so I decided to file it in as well. I think its primary fire is a bit weak, personally, but otherwise it's fine and works as intended. - The M41A Mk.2's altfire kinda renders the shotgun obsolete, since it fires a lot more pellets than the shotgun. Same with primary fire here, I think it could be buffed up a little. -I noticed that the shotgun still has the vanilla spread. Any chance of changing it up a little so it has some vertical spread and such? I also noticed a little white pixel on its barrel during the pumping animation. The dragon's breath altfire takes a little too much shells as well, and I'm not exactly sure of what it's actually doing - it seems to be a little more powerful than standard fire, though not by much. 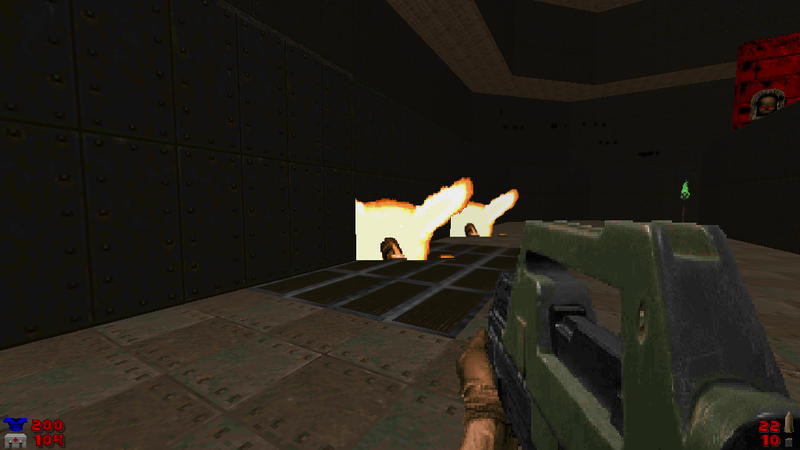 Currently, it also uses the raise sound of the flamethrower, which is a bit odd. -The flames left by the flamethrower don't damage the player, but damage the monsters. Once again, I don't think this is intentional. 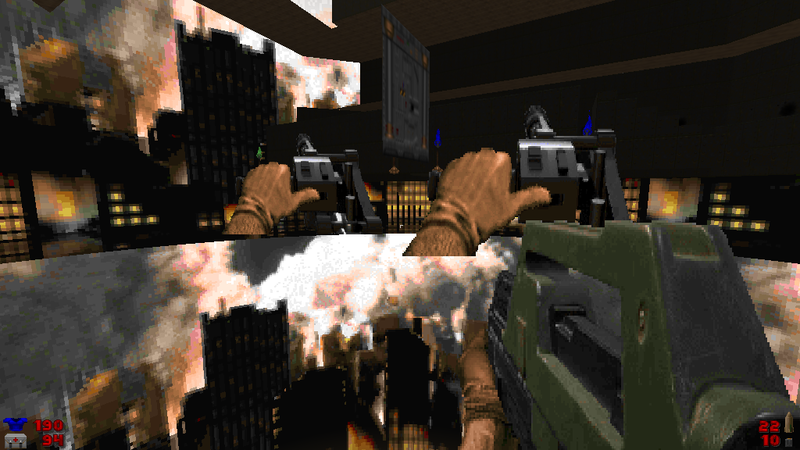 -No problems with the smartgun, at least none that I could I find aside of its sprites' mysterious appearance in map20, but the animation it plays in the altfire is a bit too quick and janky (a problem shared with the flamethrower's altfire). -On a more general note, I think that it would be a good idea to have spent casings fly out of the bullet/shell type guns as they're fired. I don't know if you intend to implement reloading or not, but it'd make things a little more interactive I suppose. If you're looking to keep the vanilla guns from showing up, I think you should replace their respective actors somehow, and you could have it so the M41A (which has an explosive altfire) replace the rocket launcher so the other guns are kinda left intact. Thank you very much for testing and feedback! Yes you did help! Hmm, honestly, I have no clue what causes this other than me maybe using a sprite name that is already in use by Doom. My Smartgun HUD sprite is called SMRTxx - anybody knows if there is a sprite called like that in Doom2? - M41A: Moved to slot 5 to line it up with classic Doom setup (Rocket Launcher alt-fire), added custom projectile that flies straight (I originally used A_ThrowGrenade with the Rocket projectile on a very high speed, hence the spread), primary damage buffed a tad. - M41A MK.2: Primary damage buffed, alt-fire cone and pellet count reduced. - Shotgun: Now a real sawn-off, wide spread, lots of pellets, alt-fire now uses custom projectile (like the M41A though this one fires Imp fireballs in addition to a smaller pellet blast basically), alt-fire ammo usage reduced to 2 per shot. - Smartgun/Flamethrower: Alt-fire animations slowed, Flamer tweaked and moved to slot 6, no player damage yet (didn't figure it out yet). SMRTxx, or SMRTA-D are the red torch lump names.